Cathy Kehler, a 50-something church worker who'd never had a serious illness, was diagnosed with early-stage breast cancer last spring. Kehler's insurance, which has a $700-a-month premium, didn't cover all of her expenses and after three operations including a double mastectomy, her out-of-pocket expenses had soared to more than $8,000. Family and friends offered emotional support, along with obligatory flowers, well-wishing cards and the occasional dinner to make life easier. But what Kehler needed was financial help for the bills weighing heavily on her when she was at her weakest. The hospital where Kehler received her treatment set her up with a financial aid counselor who helped find some supplementary government insurance -- and a novel approach to paying medical bills: crowdfunding. Kehler's hospital, part of Pinnacle Health Systems in Harrisburg, Pa., had recently partnered with a new financial services company, Someone with Group, which offers a HIPAA-compliant crowdfunding service for patient debt reduction. "There are so many folks who want to help -- family, friends and even strangers -- and they don't really know what to do. There are only so many casseroles that can be put in the freezer," said Kehler, who is single, and described herself as independent. Hesitant at first, Kehler said the hospital's financial aid workers were compassionate in helping to her to accept the idea of allowing others to help her. The outpouring of support that followed was "overwhelming," she said. 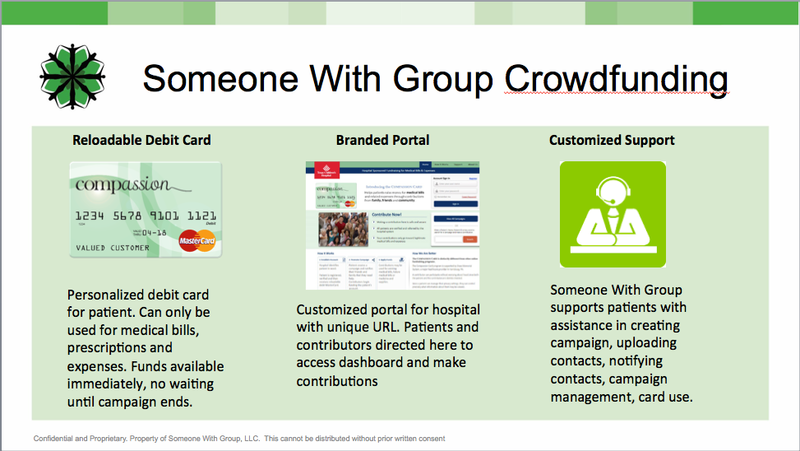 Someone With Group's crowdfunding service not only helps with individual patient debt, it addresses a systemic problem in the healthcare industry. "Obviously, with the increasing cost of healthcare, we have a significant amount of money we don't recover [from] folks who are under insured...or have a high-deductible plan and can't afford out of pocket expenses," said Bill Pugh, CFO of Pinnacle Health Systems. "It's also another arrow in our quiver in helping patients...emotionally deal with debt. "It's their choice. If they're not comfortable with it, we don't do it," Pugh added. Pinnacle Health Systems includes three hospitals and about two dozen clinics or physician practices offering everything from general medical services and surgery to advanced cardiovascular, spinal and stroke care. Pinnacle "routinely" writes off about $50 million a year in unpaid patient bills, an amount that is typical of hospital groups of its size, Pugh said. Through Someone with Group, Pinnacle Health Systems can offer patients the opportunity to raise money from friends and family through crowdsourcing campaigns, the proceeds from which go onto a Pinnacle Hope Debit Card. The card is issued by Access National Bank. Patients must be sponsored by a healthcare system to participate in a crowdfunding campaign. It's up to the hospital to vet patients and their ability to pay their bills with their own funds. Funds raised by patients through Someone With Group are loaded onto a patent-pending, reloadable debit card that may be used only for medical bills and expenses. Someone With Group launched crowdsourcing funding service under the Jumpstart Our Business Startups Act or JOBS Act, a law passed in 2012 that reduced securities regulations in order to encourage the financial services industry to fund small businesses. Jagemann-Bane previously served as a board member for Frederick Memorial HealthCare Systems in Frederick, Md. She said patients often must drain their 401k retirement accounts, open reverse mortgages and exhaust their savings as well as create mountains of debt to pay off medical expenses. "I also just marveled at the amount of bad debt healthcare systems write off every year to the tune of $40 billion," Jagemann-Bane, CEO of Someone With Group, said. "Then you consider that $6 billion is spent on cards and flowers for patients every year. Why can't we redirect that money and put it into a debit instrument restricted to medical spending only?" 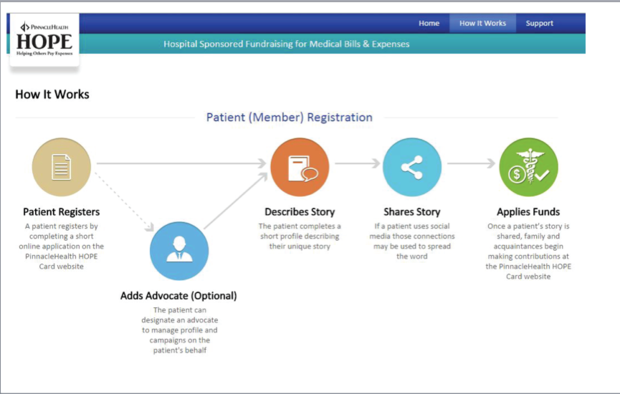 Patients who sign up for a hospital-sponsored crowdfunding campaign have their own webpage created, which can be shared with friends and family via Facebook, Twitter or email. If a patient sets their campaign webpage to be private, then only people they email directly will be able to open the URL that accesses their campaign page. If the patient sets their campaign to be public, a friend, family member, contributor or any visitor can share the link via their Facebook, Twitter, Pinterest or Google+ to further extend the effort's reach. Someone With Group just completed a one-year pilot with Pinnacle Health Systems and Jagamann said the company is now aiming to sign up 100 hospitals by 2020. To that end, Someone With Group is currently undergoing its own fundraising phase, hoping to garner $3.5 million from angel investors to expand the site in order to grow its revenue. The crowdsourcing provider pays a $50,000 licensing fee for a secure web platform through which hospitals can set up campaigns. Someone With Group makes its money by adding a 7.5% service fee on top of what contributors give to a patient's crowdsourcing campaign. "So if I give little Billy $100, I will be charged $107.50. The patient gets 100% of the gift," Jagemann said. Patients who've used the crowdfunding service on average have raised $2,315. As Kehler's medical costs mounted, she became concerned her unpaid bills would be turned over to a collections agency and her credit rating would go south. "If I'd not been made aware of it through the folks at Pinnacle Health Center, I'd be in very different circumstances," Kehler said. "When you're in a serious health situation, the thought of all the financial issues -- it's such a weight, it's almost impossible to get rid of. The reality is the bills do not stop coming in." 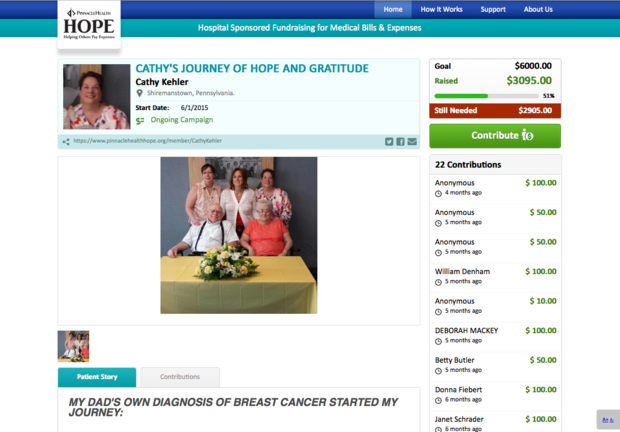 Kehler's crowdfunding campaign has raised $3,095 of a $6,000 goal, not enough to pay off all her debit, but enough to whittle away at it and keep her finances solvent. Accustomed to being a caretaker of others and a caregiver, Kehler said the hardest part of joining a crowdfunding campaign was accepting help from others. But she soon learned it allowed her friends and family to offer more than gestures of kindness. "Time and time again folks would say to me, 'We didn't know what to do. We just want to be helpful, we thought this would be helpful,'" Kehler said. "They never realized how incredibly helpful it has been."